Left to right: Jason Gotay, Diluckshan Jeyaratnam. Photo courtesy Kevin Berne and TheatreWorks. Dreamworks’ 1998 movie The Prince of Egypt, an adaptation of the story of Exodus, thrilled audiences with its superb animation and Stephen Schwartz-composed music. The film’s lynchpin song, “When You Believe,” won Schwartz an Academy Award for Best Original Song. Theatreworks’ world premiere adaptation, directed by Scott Schwartz and featuring a selection of new music, translates the majesty of the original work in a way that can only be expressed on the stage. Central to the work are Moses (Diluckshan Jeyaratnam) and his brother Ramses (Jason Gotay), crown prince of Egypt. Jeyaratnam’s Moses is mischievous, emotional, and tormented by the actions he has to take as God’s chosen one. This human interpretation of Moses is an interesting departure from the Moses-as-inscrutable-prophet version in the public perception. Meanwhile, Gotay portrays Ramses not as a force of evil, but a pitiful figure crushed by the expectations held of him. Though he is responsible for the continual enslavement of the Hebrews, it stems more from weakness than malice. 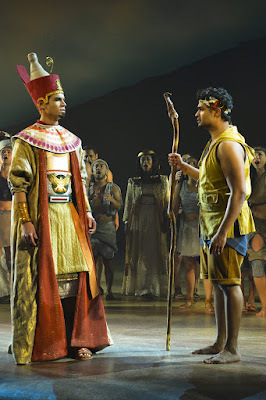 Ramses’ confrontation with Moses is as inevitable as it was in Exodus, but in this production, Gotay gives us a sense of tragedy on both sides. The rest of the cast delivers equally stellar performances. Brennyn Lark’s Tzipporah ventures into romance with Moses without losing the fiery independence at the core of her character. Tom Nelis approaches the role of old pharaoh Seti like one would approach Shakespeare’s Caesar, weighing down the younger characters with his gravitas even after his death. High priest Hotep (Will Mann) is elevated from a goofy minor antagonist in the film to a force of authority responsible for many of Ramses’ worst decisions; Mann’s balance of sinister power and cartoony outrage is perfect for the role. The songs in the musical are a combination of the award-winning soundtrack from the movie and new work made specifically for the stage adaptation. The opening song “Deliver Us” retains its overwhelming grandeur, setting the stage for the great scope of the story as a whole. Moses’ new song “Footprints on the Sand” prefaces his journey through his desire to accomplish something meaningful, not just to live in luxury. “One of Us”, another new number at the beginning of the second act, uses a jaunty tune and fun rhymes to lighten the mood before the Exodus truly begins. Because the movie made frequent use of expensive artistic elements, one would expect the stage adaptation to do the same. Instead, the technical elements are restrained, making use of minimal props and sets to tell its story. Much of the musical’s visual aesthetic is created through the work of choreographer Sean Cheeseman; a talented ensemble uses dance to construct such set pieces as the wall of an Egyptian palace or the fire through which God speaks to Moses. What can’t be represented through human motion is created through Shawn Sagady’s projection work or set designer Kevin Depinet’s multipurpose stone blocks. This technical work avoids the long shadow created by the musical’s predecessor, creating a visual spectacle that can only be achieved by live theatre. 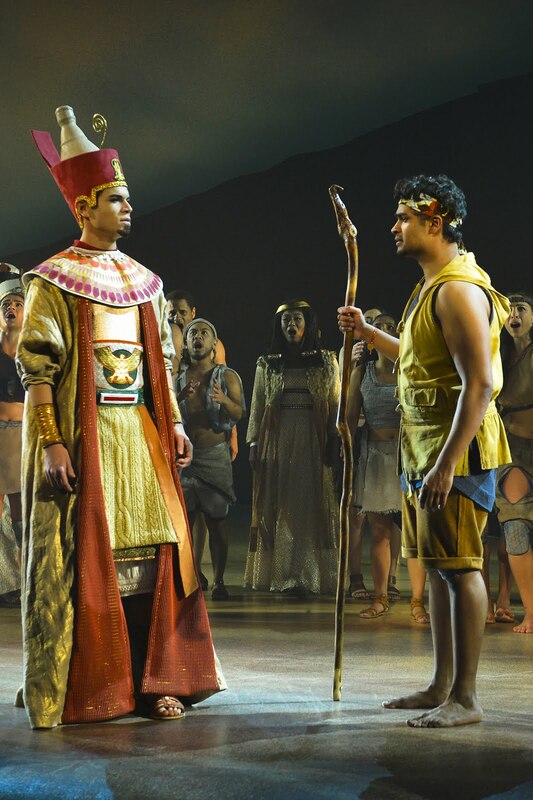 The Prince of Egypt at Theatreworks is more of a reinterpretation of both the original film and the story of Exodus than a retelling. Not only are the structure and characterization different, but even major story components like Ramses drowning in the Red Sea are changed. Even if you’ve seen the film, the stage adaptation creates a fresh perspective through a talented cast delivering new takes on familiar characters and a visual style that makes use of the theatre’s ability to represent through movement.